Your kids just got out of school and it is already time for Back To School. It’s hard to get started, so I have created this series Quick Start Back to School to get everyone going! The next post is about Back To School Clothes. Your kids keep outgrowing their clothes. They’ve been wearing gym shorts and flip flops all summer. Now it’s time for school to start and its time for Back to School clothes. Your kids drawers may not be closing because there are too many clothes. Your kids drawers may be a mishmash of all types of clothes together. Start by weeding out what is too short, too tight or not appropriate for school. 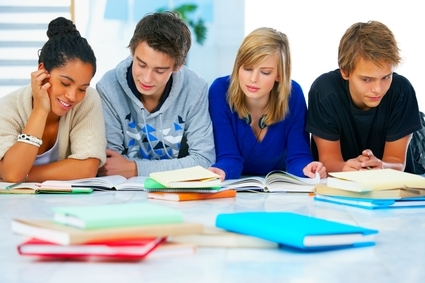 Work with each child for 15 minutes, and then finish up in an hour. Donate or consign clothes that day. Not everything will be clothes for school. Set up areas for dressy and after school clothes. 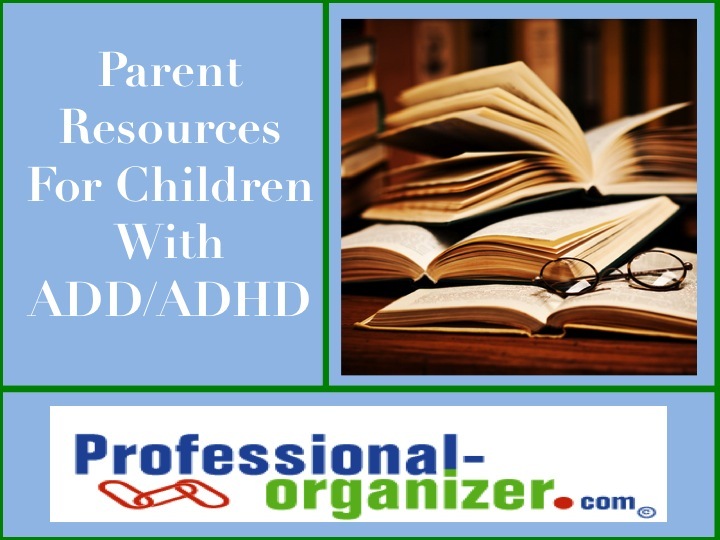 Determine what’s easiest for your child to maintain: hanging or folding clothes. Set up easy access for your child to get clothes out the night before and get ready the next day. Make a list and set a budget for clothing purchase to fill in. Have your kids lay out clothes the night before and get all their stuff ready for the next day. Start practicing this a week before school begins. Baskets and a triple slotted sorter are great for laundry routines. Each child should have a basket to carry clothes to and from the laundry room. The sorter is great in the laundry area. Host a family meeting to talk about laundry standards. When will clothes be washed and put away? Who will help with this? Having procedures in place helps everyone work as a team. 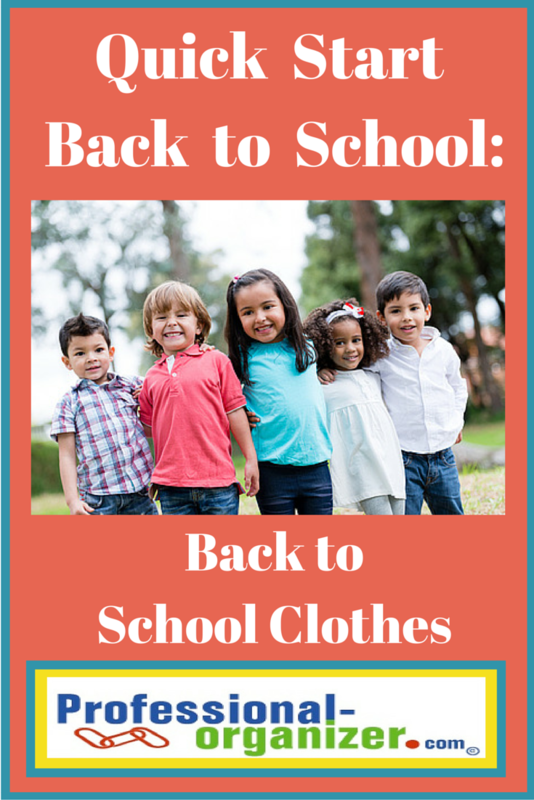 Back to school clothes can be found inexpensively at consignment shops, during tax free weekend or online at Thredup. Being organized about your shopping list saves you money! 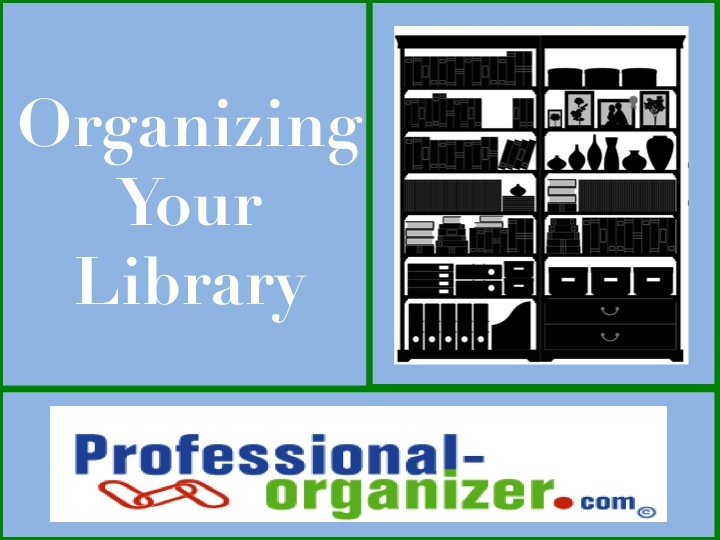 Don’t miss a minute of organizing or productivity tips. Join my newsletter. For some people, time management is a natural rhythm of the day. For some people, there is no awareness of time, time passing, arriving or leaving on time. The greatest asset for time awareness is a clock! Placing clocks in various spots in your home or office can make a difference. Having an analog clock in view helps you keep track of time and be more productive. 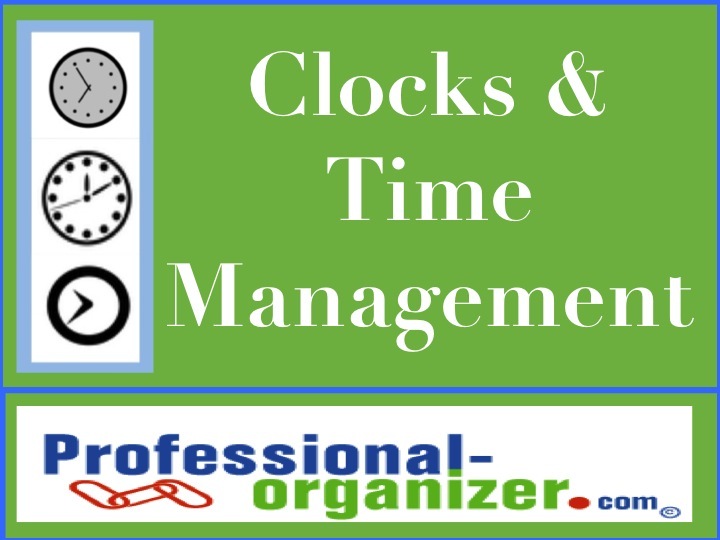 Clocks and time management are like peanut butter and jelly. Analog clocks give you a better perspective of time passing. The face of the clock, markings for each 5 minute period, and the “feel” of how long a task takes come together with an analog clock. Place analog clocks in many different places in your home and office. At a minimum, have a clock in your bathroom, in your kitchen and in your bedroom at home. It seems redundant to have a clock by your computer, but often we lose time perspective during our work. Have a clock where you can see it without getting up from your chair. Set your clocks all at the same time. Many people want to have 15 “extra” minutes as a measure to prevent tardiness. If so, set all of your clocks with the extra minutes. Setting alarms on your phone helps you if you rely on auditory cues. Set the alarm 5 minutes early so you can be sure you are ready to go even after it goes off. What places and spaces do you needs clocks in your home? With the newest technologies of Kindle and Nook, book lovers still love their libraries! Books are a tangible way to share knowledge, take to you foreign lands, and a reminder of those in our family who prized knowledge, loved to read and loved books. To some of us, a personal library is a great reflection of our inner selves. All the books in your home comprise your family library. Refering to these as your library brings a new perspective to your books and how you care for them. Keep only the books you truly love. Review your stacks annually. If your collection is always growing, you should also be eliminating too. Remember to honor your books by placing these on a book shelf. If your books are used as decor, books may be stacked horizontally. Books are not best kept in a drawer or cardboard box. Not enough book space? Add more book cases in a hall way or a guest room. Group your books by their use. Some of for a specific reference, some of just for fun, some are collections, some are read by the bed. You decide what your categories are, by both function and value. Some of my clients have organized by these groups or by alphabetical order. Books need care too! Remember to dust frequently and keep them out of damp climates. Cookbooks have special meaning to many of us. Cull through and keep what you love. 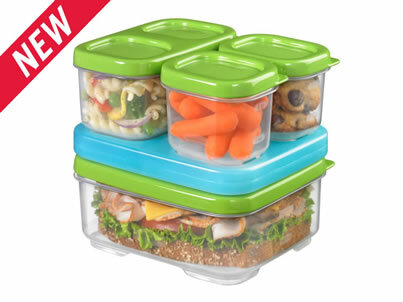 Keep them in an easy to access spot in the kitchen. Group your books that are “to be read” in a special spot, so you have access to these when you are ready to start a new one. Keep a “wish list” for upcoming reads in with your other lists, either electronically or in your command center. Do you share books in your library? Always make a note in your task list of who you are lending to and the date it was loaned. You will be able to retrieve your book easily. Books will always be a special part of who you are and what defines you. Honor them just as any keepsake. Your old cell phone can help a soldier stay in touch with family. Cell Phones for Soldiers wants to turn your old cell phones into more than 12 million minutes of prepaid calling cards for U.S. troops stationed overseas. To do so, Cell Phones for Soldiers wants to collect 50,000 cell phones each month through a network of more than 3,000 collection sites across the country. PostNet Kingwood and Professional-Organizer.com are partnering to host a drop off site in Kingwood from June 1 – July 31. PostNet Kingwood is located at 4321 Kingwood Drive in the HEB Shopping Center in Kingwood. Drop off your used cell phones and make a difference!